We decided to send Khye to a playschool a few months ago. 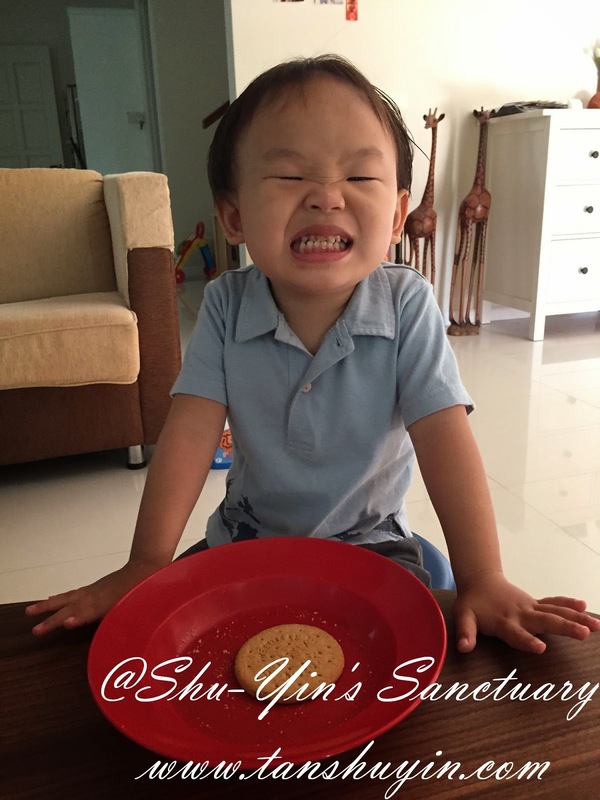 But due to CNY and our recent Sydney trip and some procrastination on my side, we only managed to start Khye in playschool this month. 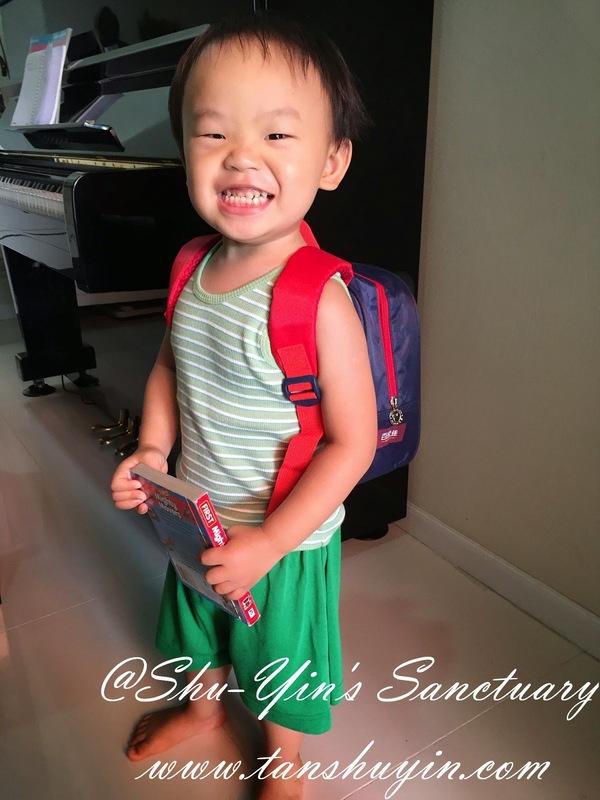 Khye starts playschool at age 2 years and 7 months old, almost the same age as Shern at age 2 years 8 mths. 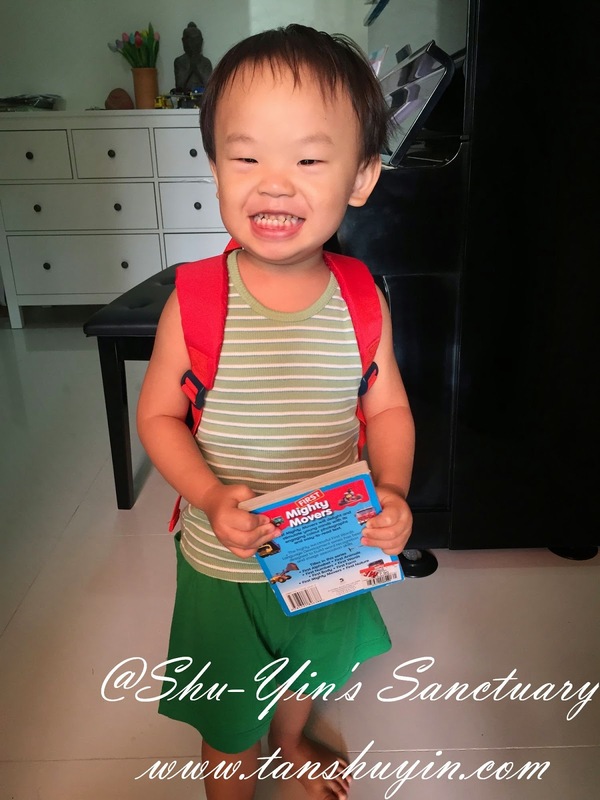 Just like during Shern's time, timing was just nice to send him to a playschool then as my tummy is starting to grow and the baby in my tummy is going to come out soon. I wouldn't want to send Khye to playschool when baby is out (fear that Khye may feel I am sending him away). I wish to send him BEFORE baby is out so that he has a routine and be familiar with the people and place. In the end, we chose a playschool which encourages play. They have outside play every single day, which is hardly a scene here in Penang. I love that. I also love their concept of 'When the kid has enough play, it is easy and the kid will be ready to absorb anything'! So this playschool has a lot of playtime and no academics, which would probably shock most parents here. I am ok with no academics as Khye is only about 2 1/2 years old. And he already knows his alphabets and numbers anyway. haha. And he can pick up some academics at home or when he is a little older. Khye handled it pretty well, (much better than Shern's time in which his bro cried non-stop and inconsable when I left him there). 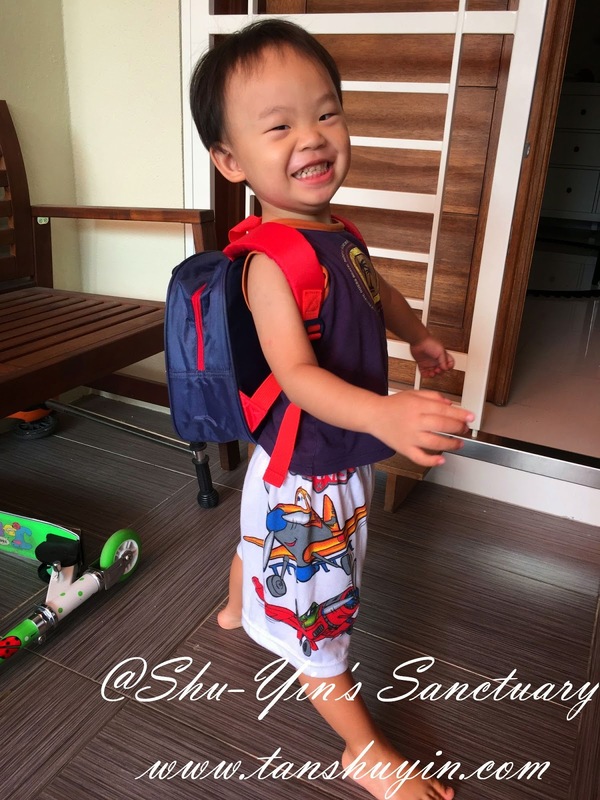 As mentioned in Khye's 2 1/2 yo Update post, Khye was all happy and smiley on his 3 days of 'trial classes', bringing along his Mickey Mouse schoolbag! And as of now, Khye has attended playschool for more than a week of half day 9am-12.30pm and it was ok, Khye is happy about going to school especially on the first few days. 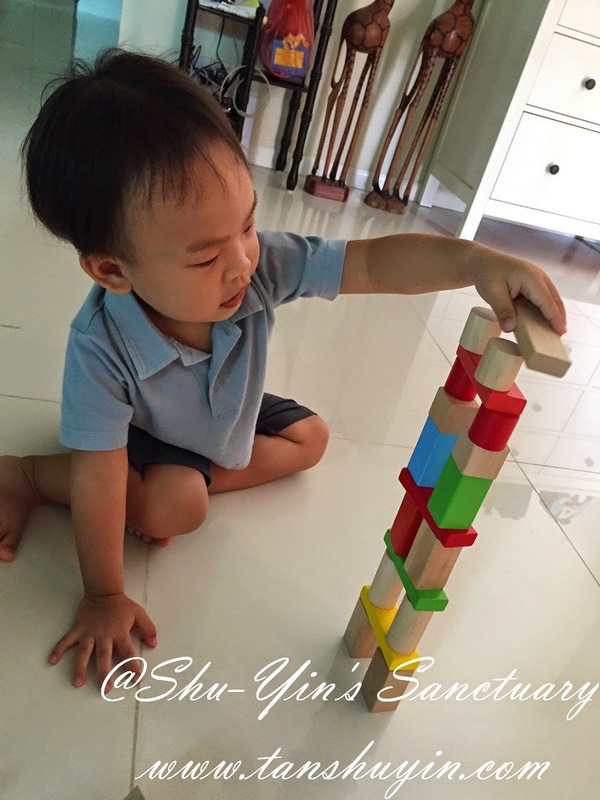 We build blocks while eating breakfast or waiting for the time to leave for school. 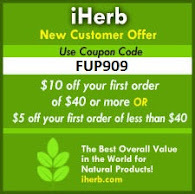 What he eats for breakfast depends on his mood, and also whatever is available, but is usually very simple. I would ask him if would like some fruits of bananas or grapes. Or sometimes half-boiled eggs with some bread. On that day, it was digestive biscuits with some Milo drink. They do serve light breakfast and also some light lunch during his 3 1/2 hours in school. And Khye is not very picky on food so he will usually eat some so I am not too worried about him going hungry. 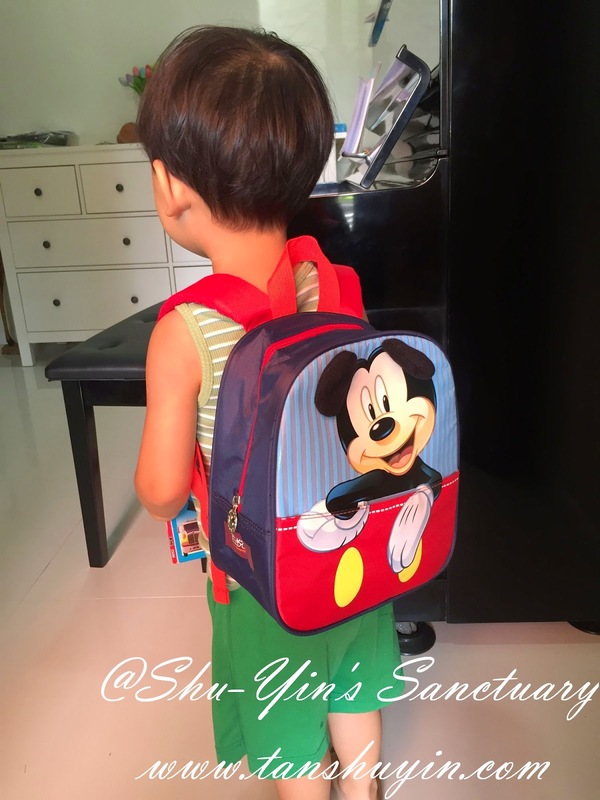 Here he was wearing his school bag and ready to go. 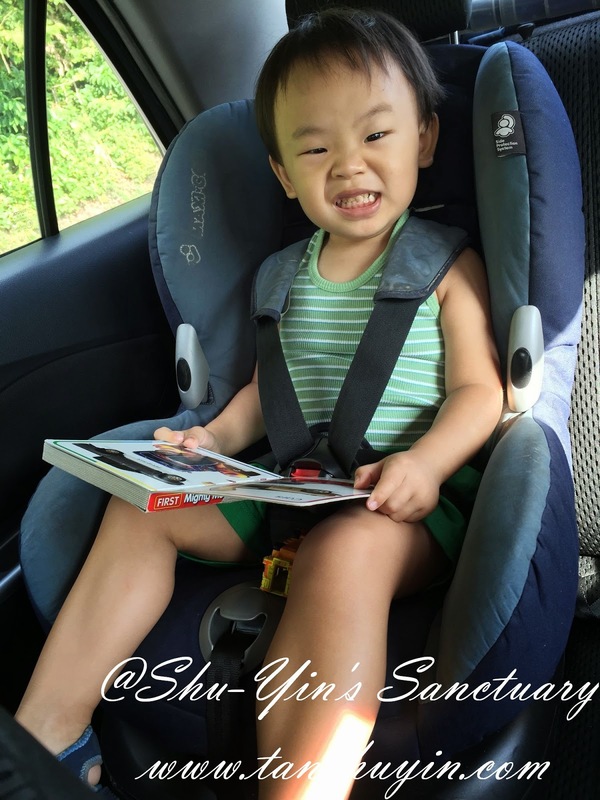 He sits in his car seat happily holding some toy cars or like that day reading his transportation book in the car. But after a few days, he got a little sad and cried when I leave. He didn't scream my name or anything, but just showed me his sad face. Luckily, he has taken a liking to one of the teachers there and he would carry him and comfort him when I leave. And every day he would tell me 'Khye only cries for 2 minutes when u leave, and then he would be playing happily!'. "_"
He cried a bit when I left but he was alright again as usual after I left. 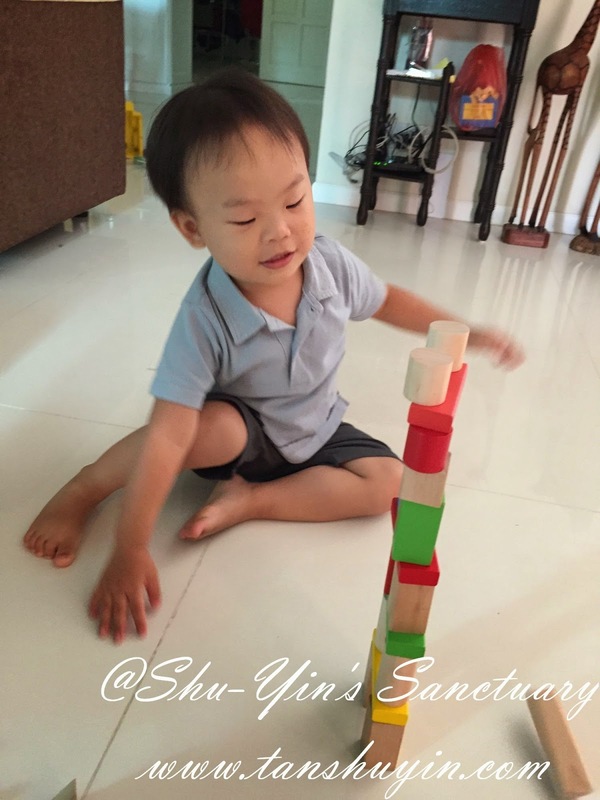 So overall, I would say that Khye settled quite well in his playschool routine.